With the new partnership with Akshay Kumar, Bengal Warriors will bring in a breath of fresh air and positivity packed with a stronger team. Mumbai: Bengal Warriors, the Kolkata based Kabaddi franchise powered by Future Group announces a partnership with Bollywood superstar Akshay Kumar. The Padma Shri and National Film Award winning actor is also extremely popular for fitness regimen and his love for sports. With the new partnership with Akshay Kumar, Bengal Warriors will bring in a breath of fresh air and positivity packed with a stronger team. Commenting about the association,Akshay Kumar says, “I have always believed that sport plays a key role in shaping ones personality and health. I have admired how Star Sports has helped make Kabaddi so popular across the length and breadth of India and I am delighted to partner with Future Group to promote a homegrown sport like Kabaddi. 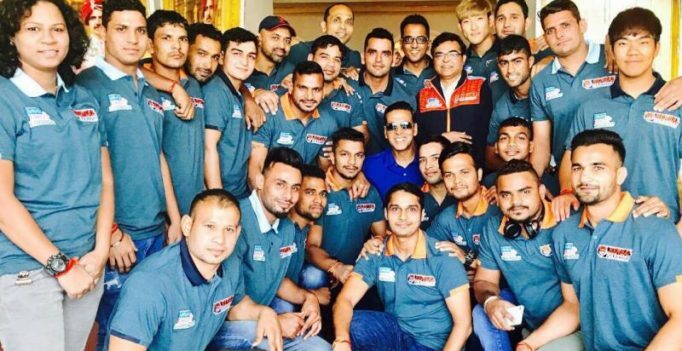 Bengal Warriors‘ revamped team features strong raiders like Jang-Kun Lee, Deepak Narwal, Anil Kumar, Kuldeep, Maninder Singh, Virender Wazir Singh, Vinod Kumar, defenders Ameares Mondal, Sandeep Malik, Surjeet, Young Chang Ko, Rahul Kumar, Shashank Wankhede and all-rounders Bhupender Singh, Ran Singh, Ravindra Ramesh Kumawat, Srikanth Tewthia and Vikash. The world is about to wake up to our wild roar. We are the Bengal Warriors. We are driven by the warrior spirit. We leave nothing to chance. We play to rule. And above all, we aim to make Kolkata proud as its home team in the Pro Kabaddi league.